This layer adds support for the Mu4e email client. Search, read, reply, move, and delete email. Search-based: no folders, only queries. UI optimized for speed: quick keystrokes for common actions. Configuration varies too much to give precise instructions. What follows is one example configuration. Refer to mu4e’s manual for more detailed configuration instructions. With `mu 0.9.16`, mu4e comes with a native contexts feature for managing multiple accounts. ;; guess or ask the correct context, e.g. Note: We used to have a hack to support multiple accounts with older version of `mu` but we removed it to encourage people to update their version and use the new contexts feature. 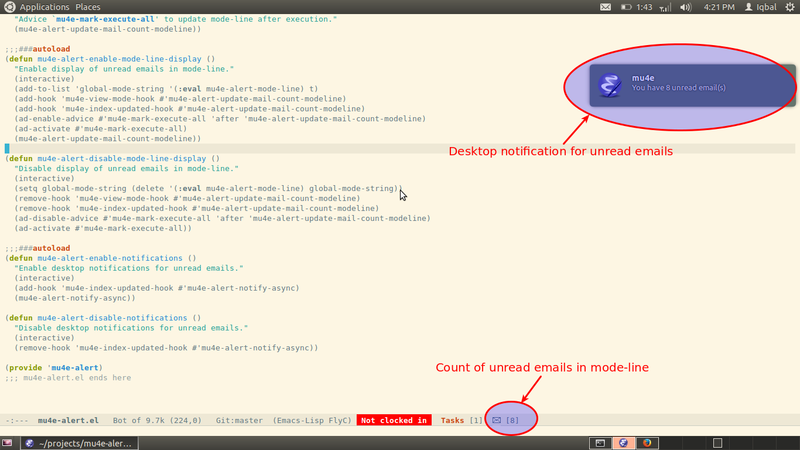 mu4e can send mails in async mode, which speeds up sending as you do not have to wait for the email to be sent. This is off by default but you can enable it by setting the mu4e-enable-async-operations variable when including the layer. mu4e-spacemacs-layout-binding for the key binding. mu4e-spacemacs-kill-layout-on-exit for automatically removing layout when quitting mu4e.